Alexander Gordon joined Westminster in 1907 and boarded in Rigaud’s House. We do not know much about his first few years at the school. In 1912 he took part in his houses’ Tug of War Team, weighing in at 11st, by the following year’s match, he had gained 10lb. He was also part of the Officer Training Corps, obtaining the rank of Lance-Corporal whilst at the school and performing well at shooting matches. When Gordon left the school in July 1913 and took up a place at Pembroke College, Cambridge. However, shortly after the outbreak of war, he joined the Queen’s Westminster Rifles, a natural choice given the rifle practice he had had at school. He took a commission at a 2nd Lieutenant in November and was promoted through the ranks, becoming a Captain in November 1916. He went out to the western front in September 1917 and was killed in action at Moeuvres in November as part of the capture of Bourlon Wood. Gordon was buried in Hermies Hill British Cemetery in France. His death is recorded on a family memorial in Highgate Cemetery. 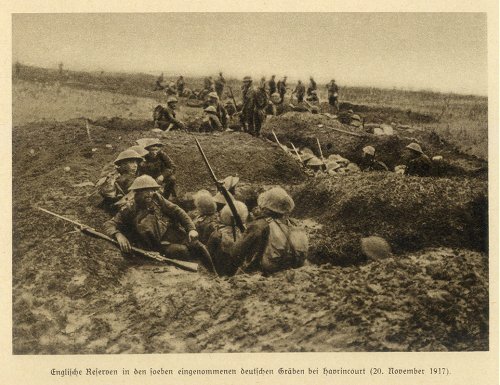 British infantry, having moved up into captured German trenches at Havrincourt, just south of Moeuvres and Bourlon, on 20th November 1917.